mid move, Orange County, circa 2009. Our house in rural Indiana, in the fancy room that we never used unless something serious was going on. “We are moving to Texas,” my dad said, as the rest of us, mother, brother, sister all sat a attention. My very first thought was of a barren moonscape, blowing tumbleweed, and our family huddled around a dim campfire, a light snow beginning to fall. I was in fourth grade, so give me a break here. Texas was nothing as I had imagined, but I had tasted the thrill of the unknown, my life forever changed. I remember the move. The trucks coming, the idea of sizing up one’s belongings, trying to determine if something was “worth it” or not. I had few personal possessions at the time. I kept my weekly allowance, $.25, in a deer scrotum at the head of my bed. It was the first thing I packed. I had my trusty bike, a plastic egg of Silly Puddy, some arrowheads, a red and white polka-dot hat, a few pairs of Toughskins and my White Freightliner trucker t-shirt. That was it. I was living free and could move at a moments notice. I was particularly enamored with the moving boxes, which were about my size, sometimes even larger. 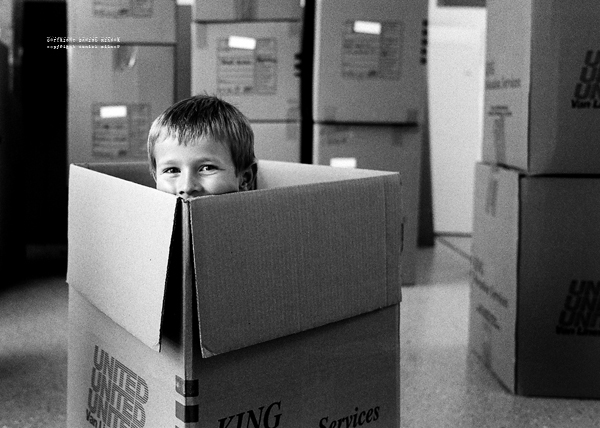 Although I had other toys, mostly strange devices with small pieces that were easily swallowed, the cardboard moving box became my favorite. The box could be a jail for my sister, or a hardy fort to protect from outside forces. The box could be a boat, adrift on the Indian Ocean, or a 4×4 vehicle careening over the open lands. Today, nothing has changed, and when people move we still use those same boxes. So recently, when some friends packed up to move, I went along to document the endeavor. I can imagine the excitement in their minds and imaginations, and also what their new life will hold for them. And decades from now, they can look back on these negatives and relive this time of transition.